Glowing radiant skin is often associated with pregnancy. Hence many pregnant women find the task of enduring acne rather formidable. However, you will be relived to know that acne during pregnancy is fairly common and can be temporary if appropriate treatment measures are taken. Thus, Your challenge is to find an appropriate treatment approach that can help you get rid of this problem in an efficient and safe manner. Ever wondered why you suddenly get acne during pregnancy after being free from this skin condition for most of your life? Blame this on the hormonal imbalance. During pregnancy there is a rise in the level of hormones like androgen that are associated closely with the oil gland. Due to miscommunication with this gland, there is a rise in the production of sebum or oil. This excess sebum combines with the dirt and dead skin cells to give rise to acne. Excessive stress, insomnia and faulty diet can also do their bit to aggravate acne during pregnancy. Toxic build up and a genetic sensitivity to hormonal imbalance are also considered to be the other two root causes of acne besides hormonal imbalance. Hence, in order to get freedom from this skin condition, you will have to treat these causes first and not the outward symptoms. Unfortunately, this type of an intelligent treatment is beyond superficial realms of conventional wisdom. Also, there are many risks associated with conventional treatment during pregnancy. It is essential that you understand what these risks are in order to avoid complications. 1. Avoid conventional drugs: Some conventional drugs include ingredients like Salicyclic acid. Salicyclic acid can be very dangerous for pregnant women as it can affect the fetus negatively in more ways than one. Drugs like Retin - A and Tetracycline are especially harmful as they can cause defective bone growth and discoloration of teeth in the fetus. Some prescription drugs are responsible for miscarriages, abnormal fetus development, heart and liver problems in fetus and other birth defects if they are taken in excess. Hence, proceed at your own risk with conventional drugs. 2. Avoid untested home remedies: Many pregnant women use home remedies to get rid of acne. However, even home remedies can cause problems in pregnant women as well as the unborn child. Hence, never use any unknown and untested remedies during pregnancy. 3. Read the labels: Sometimes, natural acne products can also contain harmful chemicals and artificial agents. You should read the labels carefully before applying the medication. Avoid using products that are reluctant to list the ingredients on the label. 4. Avoid oral medication: Oral medication whether it is natural or otherwise should be avoided as oral drugs enter your body directly and can do more harm than exterior creams and lotions. Though there are many risks associated with acne treatment during pregnancy, you can still get rid of your problem by opting for the holistic approach. Holistic approach is completely safe and has no side effects. It involves the use of multidimensional protocols including dietary changes, internal and external cleaning process and other essential lifestyle changes that can together help you get rid of this skin problem. 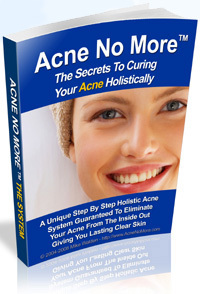 Unlike conventional medication, holistic approach cures you from acne by promoting healing right from the roots. Hence, holistic approach treats you and not the symptoms of acne. Besides the above advantages, Holistic approach is pleasingly unique as it promotes healing at physical, mental and emotional level. Hence, you can cure acne during pregnancy in true sense of the term, with the help of natural holistic approach.